Happy New Year's Eve everyone! One of my favorite things to do today is to look at my blog posts from this past year and see which ones were the most read. This year I've decided to break it down two way - my top posts written in 2015 and my top all time posts. My top 2015 blog post was a fun collaboration with Jeni of Jeni Eats on Ham Balls: An Iowa Classic. Without knowing, I gave Jeni her first taste of Ham Balls at a North Iowa Blogger get together. After that first try, she was in love! I love Jeni's enthusiasm and curiosity for local foods and traditions. 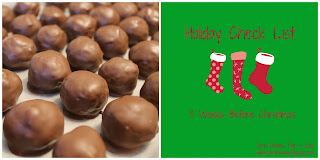 Be sure to check out this fun post, and my recipe, as well as Jeni's take on our Ham Ball day in my kitchen! My second top 2015 blog post had a North Iowa Blogger tie too. 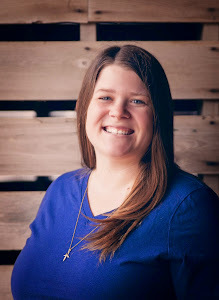 It was a tribute to my fellow North Iowa Blogger, and friend, Amy Hild of Modern Rural Living, who passed away in a tragic car accident this past winter. I will always remember Amy's zest for life, her passion and strive to learn. I'm not surprised this was one of my top 2015 blog posts, as Amy's story has made the top lists of the year for our local TV station and local newspaper. Amy still is making an impact, even from heaven! 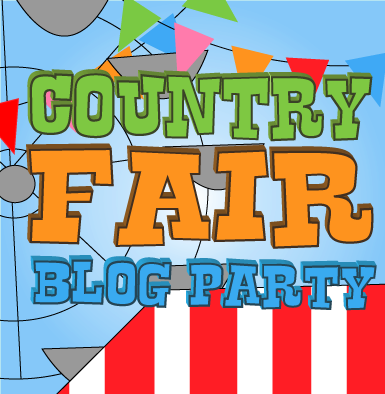 Maybe I'm starting a theme here, but my third top 2015 blog post as well had a North Iowa Blogger connection. The North Iowa Bloggers had a local Pizza Taste Off in March and I brought my family-wide famous Overnight Salad to share with the group, to help break up the amount of pizza and carbs we'd be consuming. 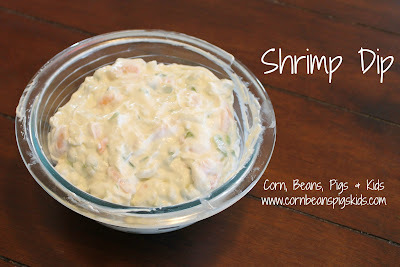 Well, it was very popular with the bloggers too, so I had to share my recipe. 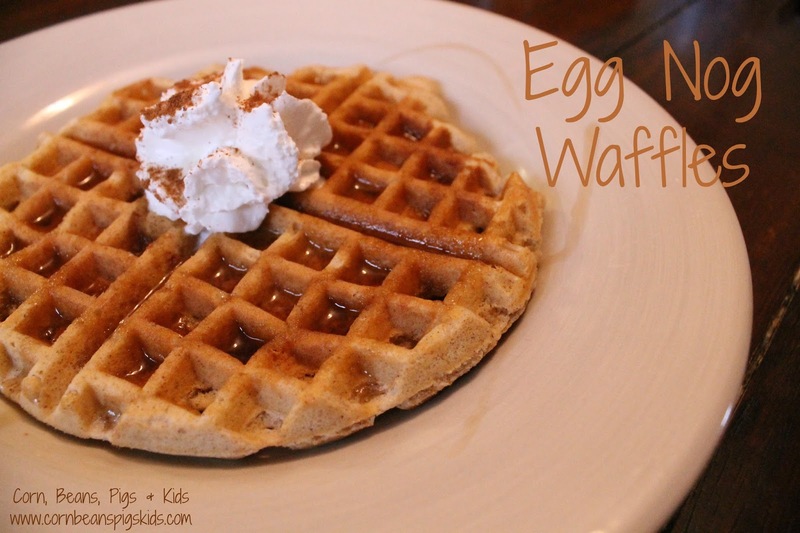 My fourth top 2015 blog post was my Celebrate Your Heritage and Mom with Kringla post. I grew up in a Norwegian area of Central Iowa where I knew who locally made the best kringla. So with Mother's Day coming up on the calendar, I thought I'd share my recipe for this sweet cookie pastry that can be ate for breakfast, snack, dessert - really anytime of the day! Rounding out the top 2015 blog posts was a my Harvest Recap post, that shared some exciting news about "New Additions" coming to the farm. I don't know if this post got so many hits because people wanted to learn about Flat Aggie visiting our farm, or wanted to learn about corn bagging, or maybe it was to find out that we are expecting "Baby Tinker" in May! 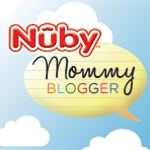 My all-time top blog post is my 5 Easy Ways to Teach Your Toddler Their ABCs and 123s post. If I've had any post come anywhere close to viral, this is it. I list a few ideas on how to incorporate the alaphbet and numbers into your daily and weekly routines to help your toddler become familiar with them. I know I'm always looking for ways to help my children learn at home, and obviously I'm not alone. My next all-time top blog post sneaked into the top 5 for the first time this year. It is a Tuesday Tasty Pork post for my Slow Cooker Hot and Spicy Ribs. This was an early post for me and doesn't even include a photo of the ribs! I'll be changing this in the New Year! I'm guessing people are googling and pinteresting slow cooker and pork and are falling upon this post. I'm all of a sudden really hungry for these pork ribs! My third all-time top blog posts is one of my all time favorites too. It is the only time My Farmer has done a guest post for me and it is on How to Have a Happy Farm Wife: Rules of a Farmer. There are certain times of the year on the farm when things are very busy, people are having little sleep and stress is high. This also seems to be the time when people can get frustrated easily with one another so My Farmer wrote a little post on what he does to keep the peace at home with me. There must be some other farmers out there looking for solutions to this time of year too! My fourth all-time top blog post is a post I did on Spreading the Love of Reading through World Book Night and the Latimer Little Free Library. Sadly, there is no World Book Night in the United States anymore, but there is still a huge, and growing movement to set up Little Free Libraries across the nation and world. I truly believe that if you can instill the love of reading at a young age, it will help your children learn and do well in school, as well as, it can be a life-long past-time and hobby. My fifth all-time top blog post is a post I did on Farming - A Family Tradition. I think it is so special that My Farmer and I both are 5th generation farmers and we are currently raising the 6th generation on our farm. We feel honored and privileged to be carrying on our family's legacy. What is your favorite blog post from 2015? Are there any top blog posts that made the list that intrigue you? Remember to Comment for a Cause! Today is the last day to comment to help the North Iowa Christmas Cheer Fund! For our son LP who is 4 1/2 years old, this was the first year he really understood "Santa" and was excited for everything Santa. He was excited to go see Santa at our local community center, excited to leave him cookies and milk, and excited to see what he'd leave in our stockings on Christmas Day morning. The best part was that he asked the wise old question, "Why does Santa bring us gifts for Jesus's birthday?". To make it simple this year, we just explained that Santa loves Jesus - just like we do, so he shares his love for Jesus with children all over the World. For our 2 1/2 year old daughter MP, she found herself in the crossroads of wanting independence, but yet at times still needing help to do things this Christmas. (Okay, maybe this wasn't just at Christmas but is the life of a 2 year old...) She had a lot of fun and joy when she could do things on her own and at her own time, but when it came to doing things not on her time, like group pictures.... well, let's just say she wasn't a fan. Her favorite part of Christmas though was probably driving around to check out people's light decorations. On Christmas Night we went on a evening car ride to see all the lights. She said "Wow" for every-single-house that had any bit of decorations. And for our 11 month daughter JP's 1st Christmas, it was a busy one, as all she really cared about was having enough space to crawl around and places to pull herself up! She did a great job spending time with many family members at each Christmas gathering, and was sure to clap for her gifts (that is if she was still near it and hadn't crawled 20 feet away by the time it was unwrapped...). Her innocent smile that she shared every day and with everyone, brought simple joy for all of us this Christmas. It was so special to see each of our kids experience the blessings of Christmas this year. What was your favorite part of Christmas? Remember to Comment for a Cause! * I received a discounted rate to facilitate my review. Between spending most of my time with people ages 4 and under, getting ready for taxes, and making sure I'm keeping up on my holiday check list, I was in desperate need for a Girls Night Out! 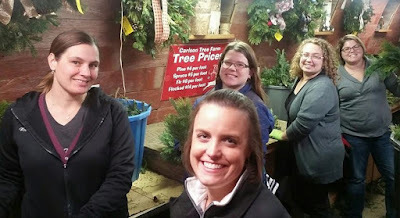 Luckily for me, the North Iowa Bloggers had a fun night planned this week at the Carlson Tree Farm in rural Coulter, Iowa, which is only 6 miles away from my house. For the second year in a row with the North Iowa Bloggers, and third year in a row for me, I made a wreath as part of the Carlson Tree Farm's weekly Wreath Workshops. The Wreath Workshops begin in mid-November and wrap up in mid-December. They announce the workshop times and dates in the fall on their Facebook page and this year all the spots were filled in literally just hours! 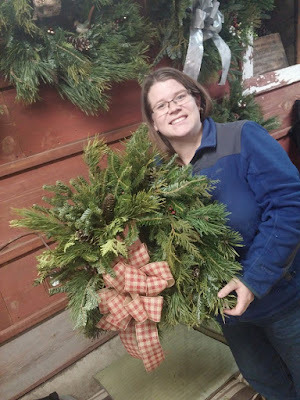 From an idea that started five years ago as a fun thing for Michelle of Carlson Tree Farm's Moms Group to do, to having 250 people participate this year, I'd say the Wreath Workshops are a success! And why wouldn't they be? In an hour and a half you go from a wire wreath frame, to picking out your favorite combination of evergreen branches to clamp down on the frame, to picking out your favorite ribbon, cones, berries, ornaments, etc. to make the wreath personalized to you and your home. The atmosphere is casual, fun, and dare I be corny by saying merry! Cathy and Michelle of Carlson Tree Farm are great leaders in both stages of making the wreath and want to see you succeed and have a good time. And I have to give a special thank you to Michelle of Carlson Tree Farm. The North Iowa Bloggers have changed a lot in the last year. 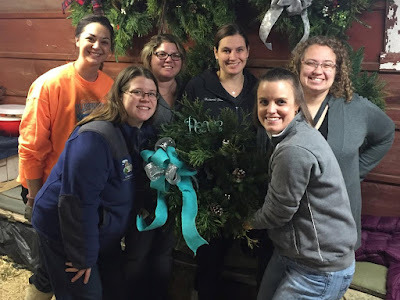 There were a few of us that participated both last year and this year in the Wreath Workshop, but we were without some great members from last year - Beth Ann and Jeni who both moved to North Carolina and St. Louis respectively, and Amy who passed away in a car accident. Amy left an impression on Michelle, as she did with so many people, so she made a wreath for this year's group to decorate that was then donated and given to Amy's parents. This meant so much to all of the North Iowa Bloggers and Amy's parents. We had fun decorating the wreath with "Amy's style" and reminiscing about our dear friend. So thanks to the North Iowa Bloggers and Carlson Tree Farm for helping me have a great time at a much needed Girls Night Out. 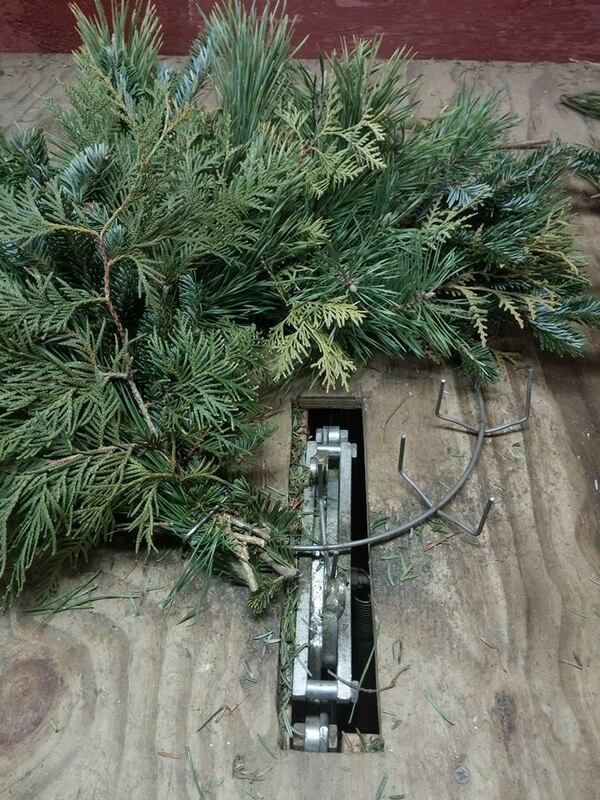 Have you ever made a wreath before? What is your favorite "Christmas" Girls Night Out activity? 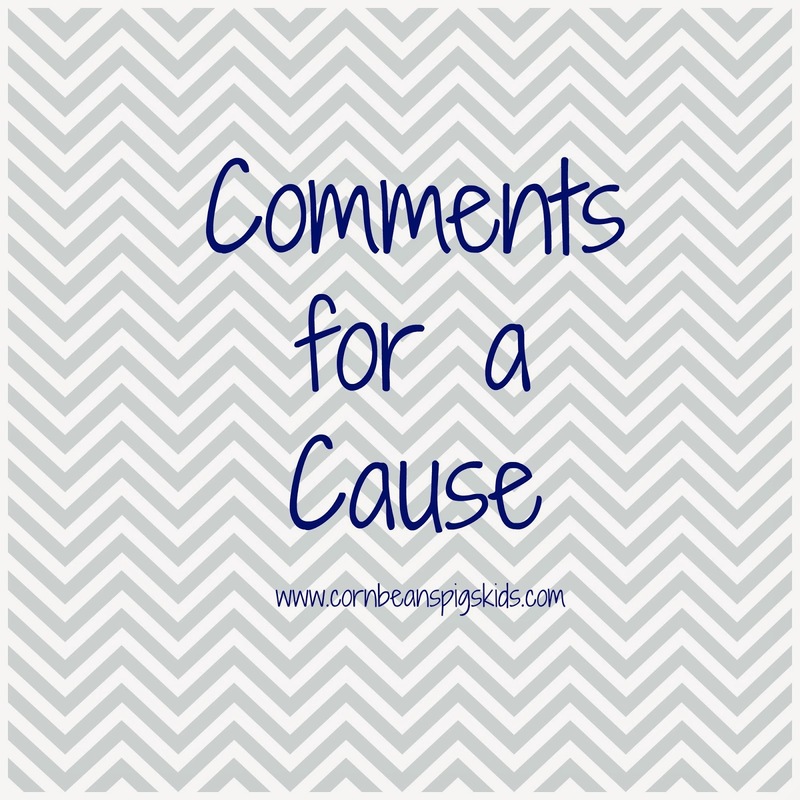 Remember to Comment for a Cause! I don't know about you, but it started feeling like two weeks before Christmas for me when I was telling the youth of church yesterday that we had to have a couple things finalized this week so I could finish the Children's Christmas Program bulletin! 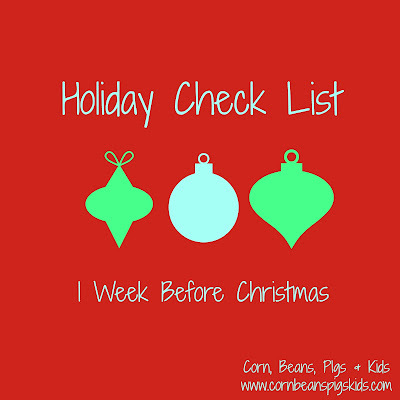 It seems just like the other week the kids were getting their parts for the first time and now I have just two weeks to make sure everything falls into place before the big night! I know we'll be good and the kids have been great at practices, it is just crazy to think that the program is already that close! 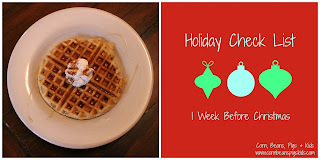 Throughout the holiday season I've been sharing a holiday recipe and my weekly holiday check list each Monday. In honor of my Mom's side of the family's Christmas this weekend (and with the help of my Facebook fans helping me decide), I thought I'd share my Grandma Joan's Gooey Wonders recipe! 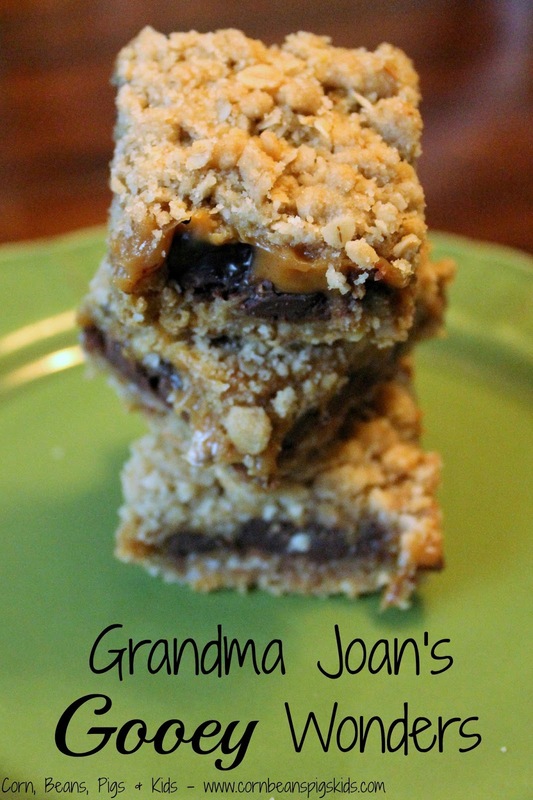 My Grandma Joan's Gooey Wonders are a staple food group at all of my Mom's family functions, especially at Christmas. My Grandma Joan brings these each Christmas and has enjoyed passing along the tradition and recipe to her grandchildren. I love to make a batch of these indulgent little squares of chocolate, gooey caramel and a delicious butter and oatmeal crumble each Christmas to add a little variety to my Christmas Cookie platters. ***Chef's note: Take your time melting the caramels and milk at a medium to medium low heat, constantly stirring. Once they have creamed together into a smooth caramel sauce, take it off the heat and set aside. You don't want to overcook your caramel; otherwise the caramel will be hard rather than gooey. Press 2/3 of the crumb mixture in a greased and floured 9x13 pan. Bake for 10 minutes at 350 degrees Fahrenheit. Remove from oven. Sprinkle 1 bag of chocolate chips over the top of the crust. Then spread the caramel sauce over the chocolate chips. Lastly, sprinkle the remaining crumb mixture on top of the bars. Bake an additional 20 minutes at 350 degrees. Now while this may be the hardest part, let the bars cool and then cut into squares. If you can't resist waiting, the bars will be extremely gooey! And a special note to all of my Iowa readers that receive Iowa Farmer Today in the mail. 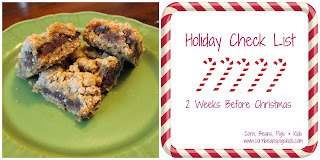 Check the paper this week as the kids and I are being featured in a Holiday Sweets Farm Kitchen section, where I share this Gooey Wonders recipe and a few others! 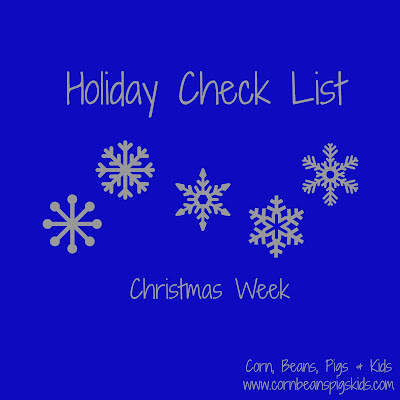 Now that you can add this recipe to your holiday baking for the week, it is time to check out what else you should be doing on my weekly Holiday Check List. Besides continuing to bake a couple Christmas cookies each week, I really need to finish everything that is involved in getting our Christmas letter out for this year. Also, this week is a great time to plan what you're making for family get-togethers and to start your grocery shopping. 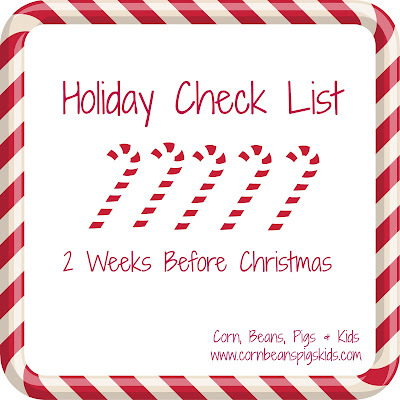 Be sure to see the complete Holiday Check List here. What are some of your family's Christmas dinner traditions? Do you go traditional like My Farmer's extended family complete with a Christmas Duck, or more hands-free and simple like my family with soups and appetizers? Remember to Comment for a Cause! Thank you to everyone checking in on me about what my new cause for the month of December is! I apologize for just now getting my new Comments for a Cause post published. But have no fear, just as if it was December 1st, I will start counting this month's donations at the beginning of the month. Now before I get into the details of December's Comments for a Cause, let's talk November's No Kid Hungry Campaign donation. In the month of November I had 46 comments equaling a $23 donation. Thank you to everyone for their comments and support! In the month of December, I will be donating $0.50 for every comment made on my blog to the North Iowa Christmas Cheer Fund. The North Iowa Christmas Cheer Fund is a special program established by North Iowa's regional newspaper, the Globe Gazette in Mason City, Iowa. In 1927, Globe Gazette Publisher Lee Loomis set out to collect donations from people across the area so that every child in North Iowa could have a present on Christmas morning. 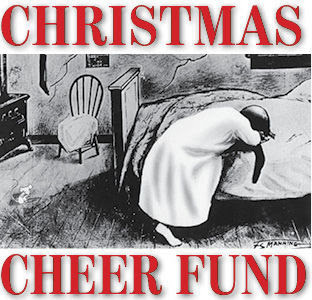 Through the years, the Cheer Fund has come to help bring Christmas Cheer to people of all ages in the form of gifts, to food, to Christmas trees, and more. Cash donations are collected and then every penny received is returned in the form of gift cards to applicants in need of help this time of year. This year's goal is $125,000. Please help me help the Cheer Fund reach that goal by commenting on any and all posts this month. If you would personally like to help as well, donations may be dropped off or mailed to the Globe Gazette Christmas Cheer Fund, Box 271, Mason City, IA 50402. People can apply for help from the Cheer Fund by filling and dropping off applications at the Globe Gazette, located at 300 N Washington Ave in Mason City during weekday hours. What help makes your home feel like Christmas? 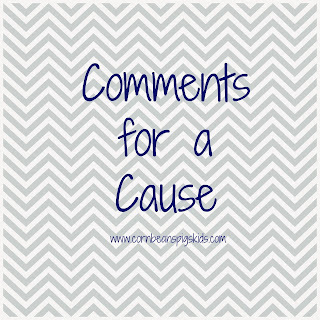 Remember to Comment for a Cause! 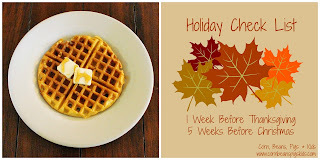 Each month I fall in love with so many recipes that are linked up on the Blog Party and November wasn't any different. 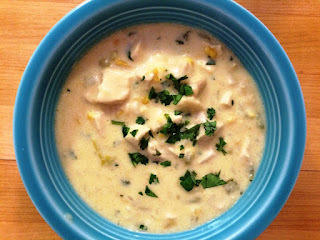 I can't wait to try Lara of My Other More Exciting Self's Mexican Turkey Corn Chowder. This will be a perfect soup to keep in my arsenal of warm-up meals this winter. I love trying new soup recipes! 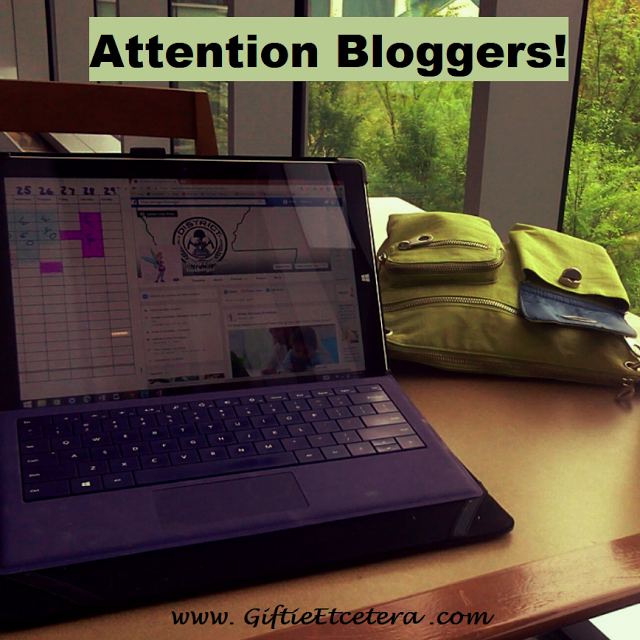 I've been using Giftie Etcetera's 7 Smart Ways to Attract Readers to Old Blog Posts to heart since reading it last month. She gives a lot of great ideas on how to reintroduce old blog posts and I have been utilizing some of her suggestions this holiday season with my weekly Holiday Check Lists. 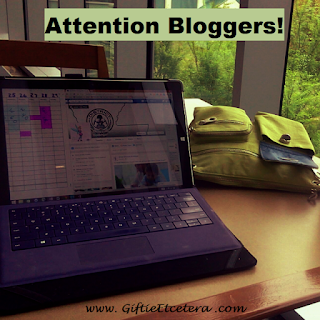 This is a great read for all bloggers! 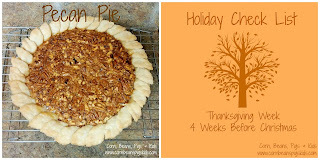 My final Blue Ribbon Winner from November is a great craft for all ages to do this month. 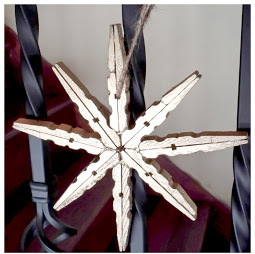 Laurie of My Husband Has Too Many Hobbies's Silver & Gold Clothespin Stars is a fun and festive ornament craft I'm planning on doing with my kids. This is an inexpensive and easy craft to do on a snow day or a lazy Sunday soon!